Rollande--how did I never see these!! Thank you so much for showing us your art. You are a wonderful artist--those are beautiful pieces! Were the landscapes commissioned, or do you just do them for fun and enjoyment? Do you sell them at all? Where is the tower in Germany located, btw? I love the one of Florence. Ah, Rollande, I can't believe I missed your beautiful works, but as I told you on LJ, I'm blind and a dork. Thank you for posting them here. 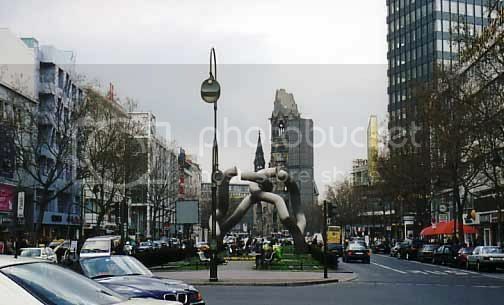 Well I may have to commission you to paint the Kurfürstendamm where my parents met in Berlin. I wish I would've known you did such beautiful work before their fiftieth last year! I can almost image what it must have looked like about 50 years ago. I found this site which feature a small picture taken a couple of years after the end of the war. Rollande, your paintings are gorgeous! I never saw them before either. Are you still painting now? Your paintings have that deep, richness of oils. I hope you do get back to your painting, because you have a good eye and are very talented.